Yesterday I made Jalapeno Pepper Jelly for the first time. During the summer our garden is always overloaded with some type of pepper. Usually it's jalapenos, because they thrive so well in the Texas heat. Once the peppers are picked comes the task of figuring out what do do with all those green beauty's. Last year I had a mixture of several peppers, so I tried my hand at a Hot Pepper Sauce. 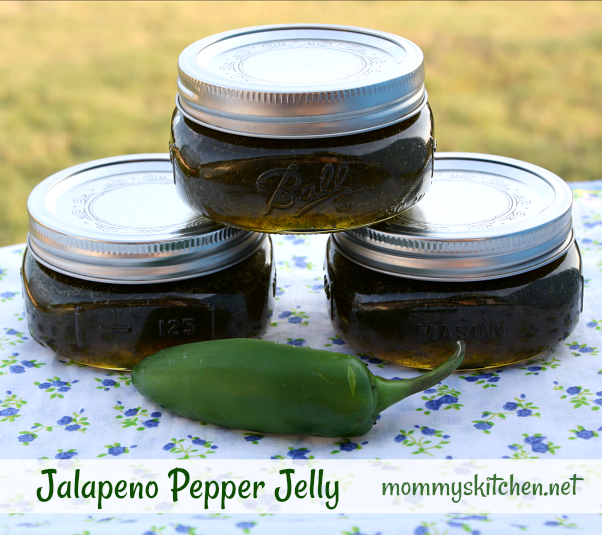 This year I chose to whip up a batch of Jalapeno Pepper Jelly! Pepper jelly has been on my to do list for quite sometime. 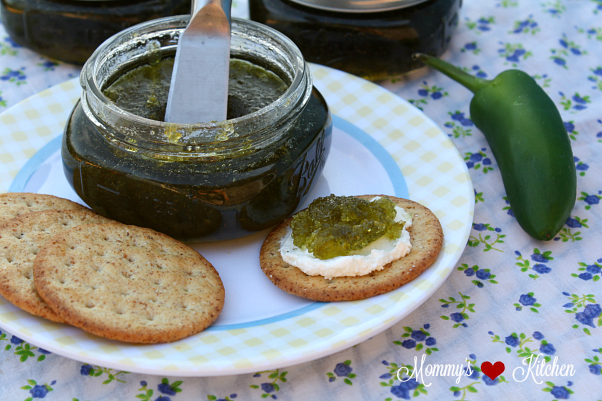 If you've never made Jalapeno Pepper Jelly it's super simple to make. If you're asking yourself this question "what the heck is jalapeno jelly and what do I do with it? Well that's a easy one. 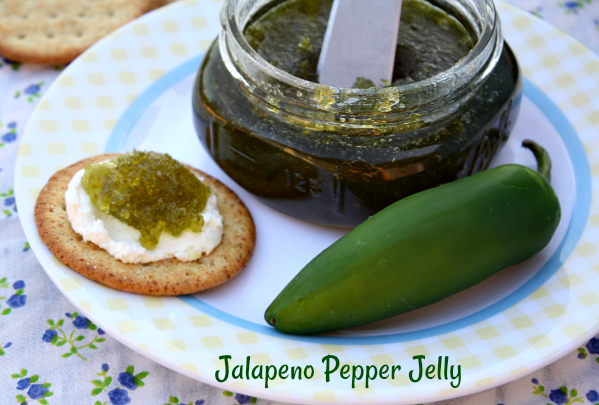 Jalapeno pepper Jelly is a sweet, somewhat spicy and tangy pepper jelly made with jalapeno peppers, vinegar and sugar. I prefer to use a combination of green bell peppers and jalapeno peppers for flavor as well as to tone down the heat a bit. Pepper Jelly makes wonderful gifts, especially around the holidays. I like to serve mine with softened cream cheese on various crackers. Jalapeno Jelly reminds me a bit of Cowboy Candy (Candied Jalapenos), but in jelly form. Now that I've made the jelly I prefer it versus the candied jalapenos. The Cowboy Candy can tend to be a bit spicy for my taste, but the jalapeno jelly has just the right amount of heat. I plan on making a double batch next time to use for holiday gifts. I don't see these 3 jars hanging around our house too long. I hope you'll give this recipe a try. 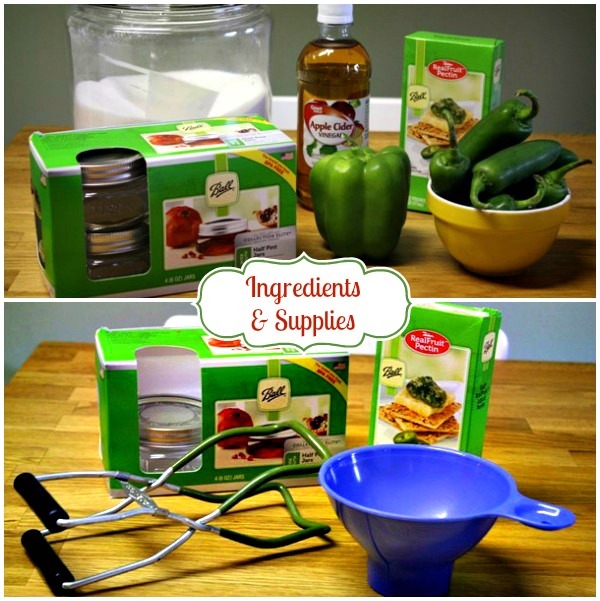 The supplies and ingredients I used were, Ball Canning Jars with Lids and Bands, Ball Liquid Pectin, Jar Lifter, Canning Funnel, Tongs, Boiling Water Canner or Large Pot, Jalapenos, Green Bell Pepper, Sugar, Green Food Coloring (if using) and Apple Cider Vinegar. If you don't have canning utensils you can pick up a packaged set pretty cheap at Walmart. I used the Ball Wide Mouth Half Pint Jars, but any 4oz or half pint jars will do. To start wash your jars in hot soapy water and then prepare the boiling water canner. If using a regular large pot place a round rack or dish cloth on the bottom of the pot. Place the jars on top of rack or dish cloth (this keep the jars from direct contact with the pot or canner). Heat jars and lids in simmer hot water bath until ready for use (do not boil). Cut off the stems and remove seed from the peppers. If you want a little bit of a kick you can leave in half of the seeds from the jalapenos. Puree peppers using a food processor or high speed blender with 1/2 cup cider vinegar until smooth (do not strain puree). In a large pot combine puree with remaining 1/2 cup cider vinegar and sugar. Remove bands and set aside leave lids in hot water until ready to use. Bring to a boil over high heat. Boil 10 minutes, stirring frequently. Add fruit pectin, squeezing the entire contents out of the pouch. Continue to boil hard for 1 minute, stirring constantly. Remove from heat and skim off any foam. Ladle into hot jar leaving 1/4 inch head space. Wipe rims with a clean cloth. Remove lids from hot water and center lids on the jars. Apply bands but do not tighten too hard. Add jars to hot water bath and process in boiling water bath for 10 minutes. Remove jars onto a dish towel or to cool completely. Check lids to make sure they have sealed after 24 hours. Lid should not pop up when center is pressed. Store properly canned jelly in pantry for up to one year. To start wash your jars in hot soapy water and then prepare the boiling water canner. If using a regular large pot place a round rack or dish cloth on the bottom of the pot. Place the jars on top of rack or dish cloth (this keep the jars from direct contact with the pot or canner). Heat jars and lids in simmer hot water bath until ready for use (do not boil). Set bands aside. Cut off the stems and remove the seeds from the peppers. If you want a bit of a kick leave in half of the jalapeno peppers. Puree peppers using a food processor or high speed blender with 1/2 cup cider vinegar until smooth (do not strain puree). In a large pot combine puree with remaining 1/2 cup cider vinegar and sugar. Bring to a boil over high heat. Boil 10 minutes, stirring frequently. Add fruit pectin, squeezing the entire contents out of the pouch. Continue to boil hard for 1 minute, stirring constantly. Remove from heat and skim off any foam. Add jars to hot water bath (making sure water completely covers the jars) and process in boiling water bath for 10 minutes (time starts after water comes to a boil). Remove jars onto a towel or hot pad to cool completely. Check lids to make they have sealed after 24 hours. Lid should not pop up when center is pressed. Serve on crackers with softened cream cheese. Cook's Note: When cutting or seeding hot peppers, wear rubber glove. Also I want to mention that next time I prepare this recipe I will be using the Certo liquid pectin. I used the Ball brand and the jelly set up really stiff and thick for my taste. If I do use the Ball pectin again I might try using just half a package and see how that does. So keep that in mind when using the Ball brand pectin. You've just reminded me I was suppose to make my mom a couple of jalepeno jelly jars that she requested. I don't see the attraction but she likes to dip chicken taquitos in it. Cat now that is different. She must like the sweet hot flavors of the jelly along with the taquitos. I've seen this before, but I've never made it myself because I can't think of many uses for it. On crackers might be okay, but I'm kinda weirded out by the idea of it being slightly sweet. What else can it be used on/in? Where I live there is a shop that serves it on hot dogs with a shot of sour cream. Sounds odd until you try it! A couple weeks ago I canned a bunch of jars of cherry, habanero, lime preserves. Let me tell you....AWESOME! A multi cherry pitter made it a quicker task. By far it as a appetizer with cracker and cream cheese, but I have added it to stir fry sauces and chicken marinades as well. Just add enough to your taste. 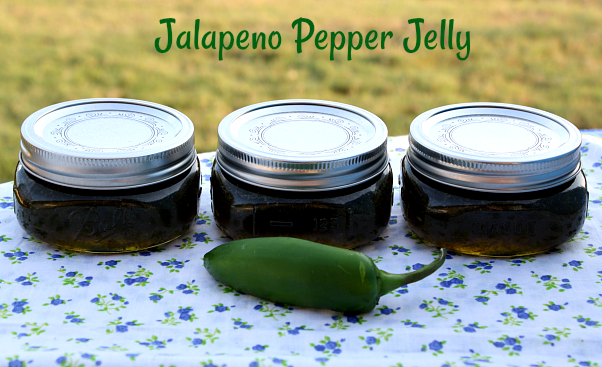 This is my first time making jalapeno jelly ,How long does it have to set in pantry before it is good to eat? Also what is the shelf life of this jelly? You can eat it right away. The shelf like is 1 year for properly canned items.